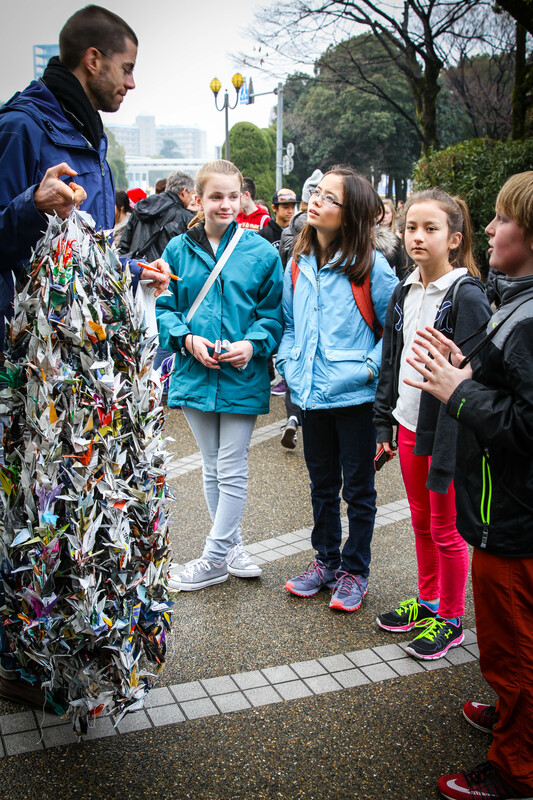 To me, paradise is 140 American 7th graders, gathered together at Ground Zero in Hiroshima, Japan 70 years after the United States annihilated the city. I know this may sound odd because to most people, the thought of 140 7th graders anywhere at any time conjures images of panic and pre-teen chaos. Images of Hiroshima City following the bomb drop are heartbreaking, sickening. But to me, this image of young kids learning about and paying tribute to those who lost their lives in an unthinkable tragedy, is beautiful. To me, that’s paradise. In class we’ve been studying the Pacific War and I’ve asked kids questions like; Can war be justified? How does war effect people? What are the long term consequences of war? etc. 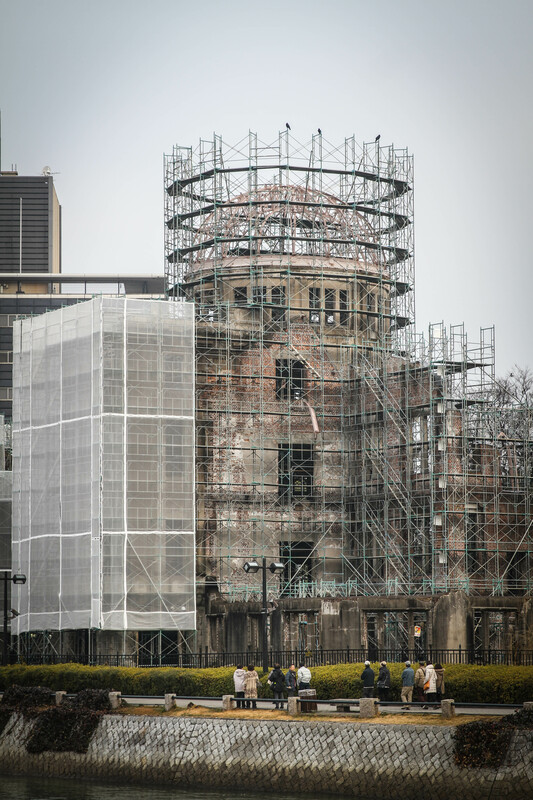 We’ve studied strategy, survivor stories, the science behind the Atomic Bomb, and Hiroshima’s heroic desire to become a symbol of world peace. Then, we took the kids to see the city firsthand. To hear the stories, see the remnants, and feel the magnitude of the event. They felt it. My amazing thirteens listened to the lost and they felt it: an overwhelming sense of the need for peace. If you haven’t visited the Peace Park, Museum, or Victims Memorial it’s worth a visit. Hiroshima is a beautiful city with meandering rivers and parks. Peaceful gatherings of friends and families can be seen strolling past Hiroshima Dome, pondering the past, looking toward the future. It’s hard to believe that in my aunt’s lifetime, this stunning jewel of a city was a place of horror and indescribable inhumanity. That’s what makes Hiroshima so remarkable. Rather than harbor anger and hatred, Hiroshima retaliated with a desire to be a symbol of peace and to bring an end to nuclear warfare. Hiroshima is such a powerful reminder of the wreckless remnants of war and the overwhelming need for world compassion that when I snapped the photo of 140 13-year-olds in that remarkable place, I felt a sense of peace. “It’s cold today,” she said. “No. Yes. Kind of I guess. I don’t know. No.” she replied. “What’s wrong?” I asked, although I already knew. She’d been asked out by the most popular boy in the 7th grade and some of the other girls were jealous and dealing with their envy in ways only 13 year old girls can. She looked at me with green eyes as big as saucers, and even though I am not a mother, I felt like one at that moment. All I wanted to do was sweep her into a hug and shelter her from the mean girls. But I didn’t. She didn’t need protection, she needed tools. Tools on how to manage hurt and betrayal and love and friends because she will be combating those demons her whole life. She needed to know that it’s ok to feel hurt and confused because being thirteen is all about being hurt and confused. She needed to know that she was feeling these things because her finely tuned emotional intuition was identifying something fishy. And when they identify something fishy it usually means something isn’t right. She gazed at me again. This time her big eyes were full of determination. “Do you think my story of 13 will be as interesting as yours was?” she asked, with the honesty that only comes with youth. After she left, I couldn’t help but think of my own story of 13. The twists, the turns, the awkward touches and glances. The weird teeth and hair. That annoying numbing feeling that comes with the ever shifting rift between wanting to stay little and wanting to be grown up. When I think about it, about my story of 13, I can’t help but be thankful for all the teachers who helped me through my awkwardness. Without them, I would not be the teacher I am today.